No need to shear this adorable little stuffed lamb every year. 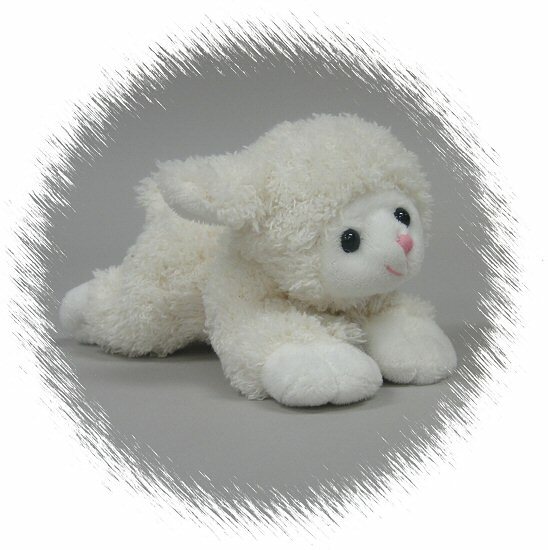 You will love this Handfuls plush lamb's super-soft cream body, pink nose, and sweet face. This little stuffed lamb is definitely a friend for life! Lana, this cute little Mini Flopsies stuffed lamb, has curly white fur, soft cream face, and pink accents. Lea, this adorable Dreamy Eyes stuffed lamb, has soft cream wooly fur, gray-brown hooves, cream face and inner ears, and big sleepy brown eyes. This adorable plush black lamb has soft black fur, dark gray face, feet, and accents, and sweet black eyes. This fun Handfuls stuffed lion has a soft tan body, fluffly mane and tail tuft, and sweet brown eyes. This Betty the Lamb giant wall decal is a delightfully blue gingham flowered lamb that will help you create a fabulous farm scene in a snap. This adorable fabric wall art standing lamb is a wonderful addition to any barnyard, farm, or outdoor theme.